Video showing a protected hammerhead shark being pulled onshore in Florida has been shared on social media. 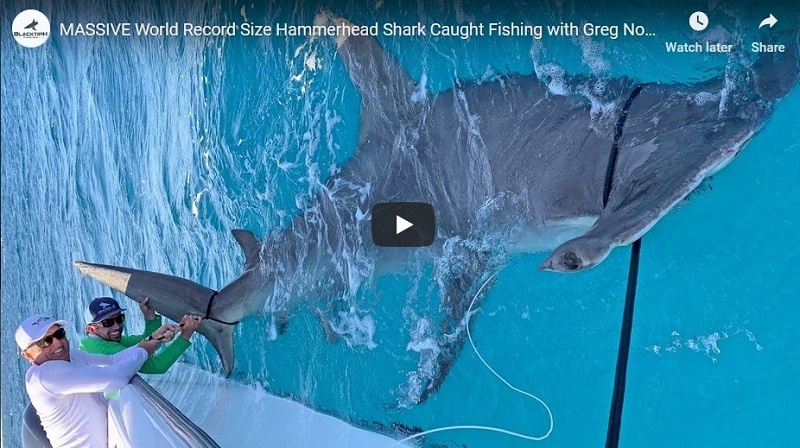 The video filmed February 8 on Singer Island shows a group of fishermen with a large hammerhead shark. Leigh Cobb spotted the group from her boat and began filming the encounter. “I was screaming at them to get it back into the water because every second that shark is not in the water, that shark is dying,” Cobb told WPBF television. “You could see them trying to get the hook off with these great big plier things that they got, these great big bolt cutters,” Cobb said. The fisherman had pulled the hammerhead shark ashore and were using bolt cutters to cut the fishing line. After cutting the line, the anglers measured the shark and then released it shortly after. Once the shark was back in the water, Cobb tracked it in her boat. “We followed it for nearly 15-minutes, and she hardly left the shore. She was exhausted, she couldn’t move, but that lactic acid build will continue for any period for up to two weeks, and that’s when we’ll find her on the beach dead,” she said. The video has brought up several concerns from the public and from shark anglers. One issue is the time of day the event takes place. Baiting sharks and fishing from the beach can draw sharks closer to shore and could lead to a negative encounter with swimmers or other ocean users. Photographs or measuring can be taken but only during the active act of release and should not delay release in any way. A video posted on Instagram appears to show the same incident, and the shark is viewed out of the surf zone as the anglers work on cutting off the hook. Hammerheads are prone to delayed mortality, in which extended fight times can lead to the shark’s death. A team of scientists from the University of Miami Abess Center for Ecosystem Science and Policy, and the Rosenstiel School of Marine and Atmospheric Science simulated catch-and-release fishing on several different species of sharks. “Our results show that while some species, like tiger sharks, can sustain and even recover from minimal catch and release fishing, other sharks, such as hammerheads are more sensitive,” according to Austin Gallagher, lead author and Abess Center doctoral candidate. “Our study also revealed that just because a shark swims away after it is released, doesn’t mean that it will survive the encounter. This has serious conservation implications because those fragile species might need to be managed separately, especially if we are striving for sustainability in catch and release fishing and even in bycatch scenarios,” Austin added. Hammerheads were found to be the most susceptible to the stress of being hooked. Anglers have also weighed in on the situation. “Should it be found that any laws have been broken here, intentionally or not, the situation can be used as a learning experience,” said Ron Babington, recreational shark fisherman. “Stories like this often lead to the vilification of a group based on the actions of a few. “What should happen here is that the fisherman answer to FWC and the courts if needed, while the public and fishermen alike use it as a learning opportunity. Most shark fishermen are true sportsmen who appreciate the beauty of these animals and strive to protect them. “I think the sport would be ruined for me if I ever learned I caused one to die, even if it was a 100 percent legal catch,” he added. The FWC reported being aware of the video, and law enforcement was looking into the situation. “Just a quick follow up; a dead great hammerhead washed up on the beach in Delray on Sunday [February 18, 2018] , there is no coincidence I said in less than 2 weeks we will find her washed up dead,” Leigh Cobb told Tracking Sharks 02/21/18 via email. If you suspect someone is abusing wildlife, alert the Florida officials by calling the Wildlife Alert Hotline at (888)404-3922 or Tip@MyFWC.com.